If you’re in the habit of sitting on a wallet that you normally carry around in your back pocket you’re inadvertently increasing your risk of developing back pain, neck pain, sciatica and other problems with your spine. 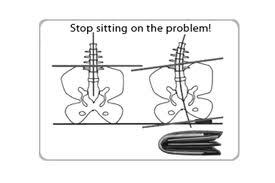 This is because sitting on your wallet – some of which can be more than an inch in thickness – is effectively like placing a wedge under one side of your pelvis, causing it to become twisted and unlevel, and disrupting the stable foundation it is meant to provide for the rest of your spinal column. As a result, the rest of your spinal alignment will gradually change as your body attempts to compensate for the pelvic imbalance, undermining your spinal function and predisposing you to a host of problems that can range from things like headaches, neck pain and back pain all the way through to sciatica, hip and knee problems, and other issues with the lower limb. The bottom line is that our bodies are constantly moulded by the wear and tear of life. Over time a simple piece of advice and a minor change in habit can make a big difference, and people who spend a lot of time sitting with a wallet crammed into the back pocket of their trousers are ultimately doing themselves as much of a disservice as ladies who carry a heavy oversized handbag that is constantly slung across the same shoulder day after day, and week after week. Of course, the irony is that even though you – and your employer – may have gone to great lengths to ensure that you’re sitting properly on a decent chair at an ergonomically designed work station, that wallet in your back pocket could be ruining everything. Spinal pain and sciatica are thought to affect 70-80% of people worldwide at some point in their lives, and chiropractors and osteopaths are experts in the treatment and prevention of these kinds of problems, so if you need further information or help please do get in touch by calling (0191) 491 5111.